Christmas is just around the corner and if I know you, I’m sure you’re already planning for the big day. You’ve got your list all set. You’ve been checking off items and diligently planning. Everyone seems to love this time year and the hustle and bustle. I know it’s definitely my favorite. I’m always sad when the day is over. All the wrapping paper all over the floor. Toys and boxes scattered about. Christmas morning goes so quickly, and I just want to make it last! So this year, break out your camera and capture some memories that you can relive the whole year through. 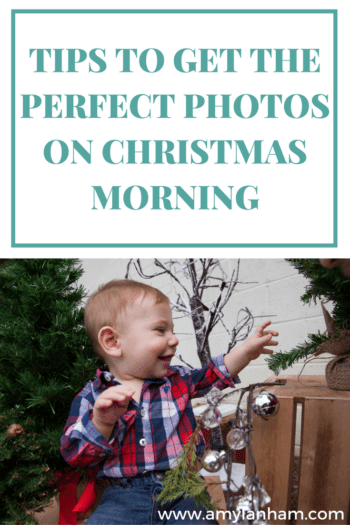 These tips will help you get perfect pictures on Christmas morning! Ask any professional photographer and they will tell you that the most important aspect of photography is having good light. This is especially true when using a point and shoot or cell phone camera. These tend to not perform great in low light. The early morning light that is available outdoors when you are normally opening your Christmas presents is the perfect light! So if you have a large window in the room where you are going to be opening presents, open that up and position your subjects so that they are facing that light source. This will make sure that they are evenly lit and should give you enough light. This will improve your pictures immensely and make sure that you get the perfect pictures. There’s going to be a lot of wrapping paper and bows and ribbons flying, and while I think a picture of some of this destruction will make for great memories for years to come, some people may not like the distractions. So if the wrapping paper will bother you, clean up the wrapping as you go to ensure perfect pictures. More importantly, if you have a party the night before and there is left over clutter or if you eat or have your morning coffee while unwrapping gifts, make sure to move these items out of the way. No matter what great facial expression little Timmy is making after getting that toy he begged you for all season, your eye will naturally gravitate towards that half eaten piece french toast in the frame. Many people want to take pictures of the gifts that they have received. We’re always telling people to hold up their presents so we can take pictures of them. I remember my family doing this when we opened up our wedding gifts and this practice confuses me. In the years to come, you nor whoever you are photographing are going to care about what they were given. Unfortunately, that’s just the sad truth. If you want to commemorate all the gifts, maybe take pictures of them at the end, to remember what they were given, or only take pictures of the big ticket items received. Instead of focusing on the gifts, focus on the people. Focus on the emotion. Focus on the excitement. The kids tearing into the wrapping paper. The way their eyes light up when they see the toy they’ve been waiting for. Focus on people handing out gifts and the way people interact with one another. Focus on the genuine moments that just overflow from this day. Those are the things you will want to remember for years to come. Finally, make sure not to spend all your time behind the lens. The best part about this day is spending time with friends and family and really enjoying making memories together. Sure its great to have photos of the memories that you made, but remember to be in the moment and put the camera down. I would love to see some of the photos from your Christmas and if you want to see some from mine, be sure to follow me on Facebook and Instagram!